The Cuban solenodon is an insectivore weighing about 1 kg (2.2 lb). It is found in dense, humid forests and brush country, as well as around plantations. Insects and spiders found in soil and leaf litter form most of its diet. The Cuban solenodon is mainly nocturnal, hiding during the day in rock clefts, hollow trees, or burrows which it excavates itself. Solenodons obtain food by rooting in the ground with their snouts and by tearing into rotten logs and trees with their foreclaws. The 1 or 2 young in a litter are born in a nesting burrow. By 1970, some thought that the Cuban solenodon had become extinct, since no specimens had been found since 1890. However, three were captured in 1974 and 1975, and subsequent surveys showed that it still occurred in many places in central and western Oriente Province, at the eastern end of Cuba. However, it is rare everywhere. Introduction of the Burmese mongoose into Cuba is believed to have accounted for the near-extermination of the solenodon. Currently, feral cats are probably the greatest threat, since the areas the solenodon inhabits now is not good mongoose habitat. In addition to predation by introduced predators, habitat loss is also a factor contributing to the solenodon's rarity. The Cuban solenodon is not hunted for food. *** By 1970, some presumed the Cuban solenodon to be extinct, since no specimens had been collected since 1890. *** As in most nocturnal terrestrial insectivores, its sense of touch is highly developed, while smell and hearing are also important. *** Solenodons can climb near-vertical surfaces, but they spend most of the time foraging on the ground. *** The Cuban and Haitian solenodons secrete poison from a gland above their teeth to subdue prey. *** Solenodons have a long life span and low reproductive rate, as a result of having been among the dominant predators before Europeans colonized the New World. The Cuban solenodon weighs 700 - 1000 g (25 - 35 oz). 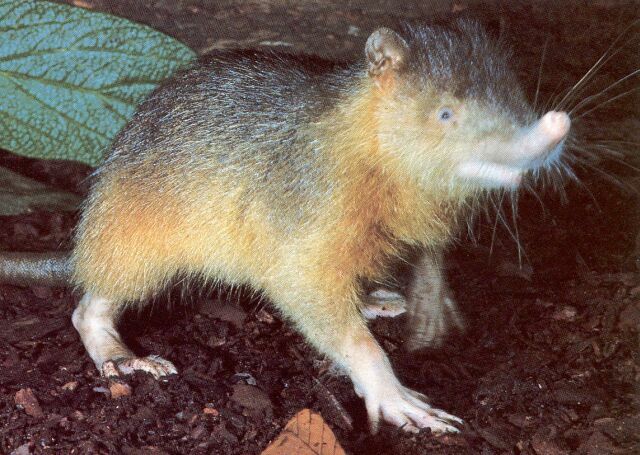 The Cuban solenodon is found in dense, humid forests and brush country, as well as around plantations. 1 or 2 young per litter. The young are born in a nesting burrow. Young Cuban solenodons remain with their mother for several months, which is exceptionally long for insectivores. Insects and spiders found in soil and leaf litter form most of its diet. The Cuban solenodon is mainly nocturnal, hiding during the day in rock clefts, hollow trees, or burrows which it excavates itself. Solenodons obtain food by rooting in the ground with their snouts and by tearing into rotten logs and trees with their foreclaws. Adult Cuban solenodons are solitary, other than mothers with young.